A leading U.S. chemical company upgraded air pollution control of maleic anhydride fumes at one of its overseas plants by installing a venturi scrubber. 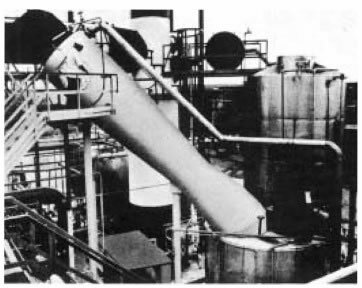 Selection of the scrubber was based on a pilot study to determine the percentage recovery and the maximum solution concentration of maleic anhydride that could be achieved using a wet scrubber. One significant reason for pretesting the installation is that maleic anhydride fumes sublime. This makes it. impractical to predict particle size and calculate removal efficiencies in advance. its capability of entraining and scrubbing large volumes of fumes without the use of fans or other moving parts in the air stream. scrubbed product can be effectively recovered and recycled at up to 10 to 20 wt % solution. 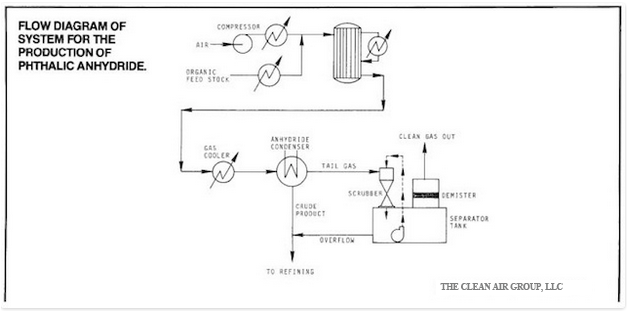 design of scrubber avoided the problem of plugging, often encountered in condensing anhydrides in units with narrow restrictions. the capability to adapt the unit to the existing plant piping systems, saving thousands of dollars in installation costs. Instead of installing the scrubber in the usual vertical position over the separator tank, the unit was tilted 45″ to fit the existing ductwork. This eliminated costs of additional large stainless steel ductwork, higher maintenance scaffolding, additional structural members and longer installation time without reducing the efficiency of the scrubber. The all stainless (304L alloy) unit handles 180,000 lb/hr of saturated air at 120F. Motivating fluid for the scrubber is anhydride solution, supplied at the rate of about 1300 gpm by a recirculating pump at 88 psig. The liquid leaves the nozzle in the venturi in a hollow cone spray, creating a draft which draws the fumes into the spray stream. The gases discharge into the separator tank. 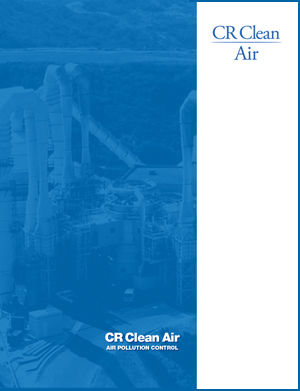 Clean air passes out through a mist eliminator and is vented to the atmosphere. A special feature of this particular unit is a set of small washdown nozzles located inside the scrubber. These. small nozzles set up a spiral washdown flow, continually wetting all internal surfaces to avoid the possibility of accumulation of product and plugging. The recovered material is returned to the production process. Liquid in the separator tank is pumped back to the spray nozzle at the top of the scrubber.